Truck Bar On Rent . Indian events are extravagant affairs, celebrated with much pomp and flair. Our diverse cultures and traditions are what bring events alive. We Indians are fond of food and drinks at any and every occasion. Having a truck bar in your event makes the mood for one big party. Truck Bar Counter For Rent. 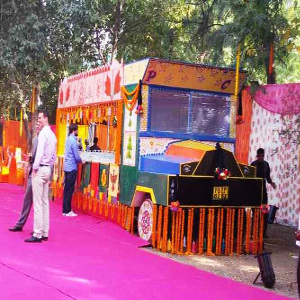 Truck bars have been a long time favorite and they’re also a super popular trend in any event. For the people who love a dash of funky look no further than this bar disguised as a truck. Truck Bar In Delhi. 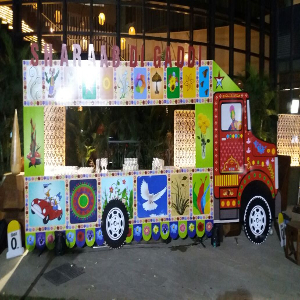 The front face of an actual truck is attached to a regular bar for a cool vibe to the event. 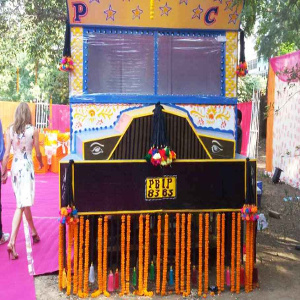 Our coordinators take your cocktail bar decor to another level with a quirky and colorful Indian truck serving drinks to your guests. Truck Bar Counter For Rent. Hence we take the truck bar to the next level with indianised cocktails like Aam Panna, Mojito, Roohafza, Vodka and many more. Truck Bar In Delhi. Therefore we make the truck bar look ethereal and modern with suspended lighting in interiors and the settings. It is going to grab hell lot of attention. To make the event an instant hit among the guests, we offer them unique drinks served in an exquisite way. Truck Bar For Hire. Therefore our bartenders are expert in preparing concoctions from various alcohols. They also add desi tadka to the drinks to match the decor of the bar. Truck Bar On Rent. Since to add the fun, our bartenders and waiters dress-up like truck drivers. We provide khaat style sitting arrangement and serving drinks in steel or brass utensils with starter. It gives your party a true desi look and makes your guests remember the event night forever. Truck Bar For Hire. Some other activity Air hockey , Ball in the bucket , Jenga game and even more..
Blog : Services & Activity.